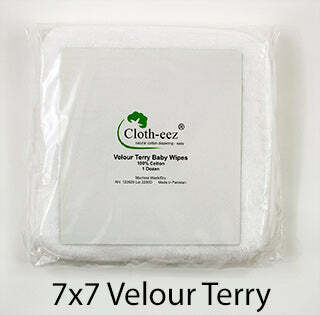 Velour Terry Baby Wipes 7x7 inches in packs of 12. Use as baby wipes or baby washcloths. 100% cotton. Cloth-eez® 100% cotton, velour on one side and terry on the other side. One layer but two different surfaces. 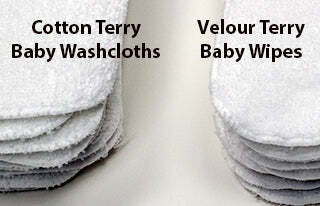 The velour side is very soft and has a velvety feel, while the terry side is regular terry and great because it doesn't just smear things but instead grabs what needs to be grabbed. This is not polyester velour, which is slick and slippery, it is 100% cotton velour which is a napped cotton terry. It's a small washcloth. It is a nice fabric and a nice size for use as baby wipes or as baby washcloths. Unlike other baby washcloths you'll find in superstores, ours are 100% cotton. Cotton doesn't get stinky like polyester can, and these are a little thicker and nicer than those thin 20% polyester big-box-brand kind that become scratchy. 100% cotton is hard to find these days and 100% cotton is so much nicer. Made in Pakistan. Cloth-eez® brand. 7x7 inches. Sold in packages of 12. Literally I will not purchase any other wipe, these wipes are thick, durable, and extremely soft. I wouldn’t want to wipe my child’s bum with anything else! Can a baby wipe spark joy? Yes it can. 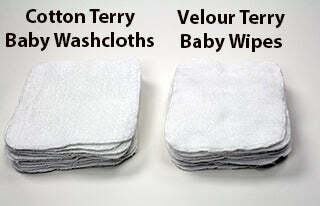 I’ve tried many types of cloth wipes and these are by far my favorite. Soft, yet with enough texture to get the job done. 100% cotton is a huge plus. High quality and the perfect size for a wipes warmer. Get these ones! You won’t regret it. I love these, and so does my opinionated and vocal 15-month-old. I can’t remember how many kids back I got these, but they might be on their fourth. One of the dozen has pulled away from the edge serging, and is becoming frayed, but I feel like that’s pretty good for all the years of use we’ve given them. I usually only need two of these, even with a messy cleanup, and if I use flannel wipes, I often need 3 or 4. I keep them unfolded in a pile, and just wet them with warm water from the sink when I need to use them. They are so grippy they clean great with just water, and my daughter is much more cooperative with diaper changes than when I was using the disposable wipes. She just lays there and lets me finish instead of thrashing like a beached shark. Buy these they clean so well ..toddler poo and all! We have used these wipes to diaper two children and I just bought more to beef up our stash for when we will have two in diapers when number 3 arrives. They are great for faces too. We keep them dry and bring a spray bottle to wet them. They work so well at cleaning up #2 diapers.